Video can play an important role in helping you reach a wider fan base. It’s a digital world and that means inspiring performances can take the Internet by storm. But you can’t capture your music with just any camera. You need one that records incredible audio. 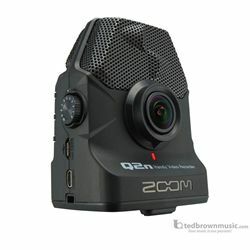 The Zoom Q2n gives you a fast and easy way to create HD videos with high impact audio. The built in X/Y microphones capture sound with beautiful stereo imaging and the 160 degree wide angle lens excels in an array of lighting conditions whether you’re filming at home, in a rehearsal space or at a club, with the Q2n, you can make videos that sound as great as they look. High-resolution 24-bit/96 kHz audio delivers studio quality recording, no matter where you’re filming. And the camera’s built in X/Y microphones can handle sound pressure levels up to 120 dB SPL, for distortion free recording. The Q2n can handle high sound pressure levels without distortion or clipping. Ten Scene presets allow you to record in a wide range of environments, including low-light. The presets range from “Concert Light,” which automatically adjusts for changing lighting conditions to ‘Concert Lo-Lit’ for dimly lit rooms. And there are scene settings tailored specifically for filming in jazz clubs and rehearsal studios, as well as outdoors. The Q2n features a 160 degree wide-angle lens that captures stunning video. And it records in 720p or 1080p HD resolution, using the same 24 fps or 30 fps frame rate used in film. An F2.0 aperture makes the Q2n perfect for musicians who perform in a wide variety of lighting environments. Capture the full band or focus on an individual performer using five field of view (FOV) settings.